You're a responsible pet owner and you take good care of your pet. But do you always remember to take care of your pet's teeth? Dental disease, specifically periodontal disease, is the most common ailment affecting pet dogs and cats. According to the American Veterinary Dental Society, more than 80% of dogs and 70% of cats develop gum disease by the age of three. Periodontal disease can have a serious impact on your pet's well-being and general health. Regular dental check-ups at Veterinary Medical Center, combined with good dental hygiene at home, can increase your pet's health and vitality, and help ensure your pet leads the best life possible. If left untreated, dental disease can not only be painful and inhibit proper nutrition, but can also lead to serious systemic issues that may threaten your pet's overall health before symptoms are noticeable. For those reasons, our veterinary team strongly considers dental care an important piece of your dog's or cat's preventive health care program. Just like in humans, infection and inflammation of the gums and supporting tissues of the teeth are caused by bacteria present in plaque and tartar. When tartar builds up on your pet's teeth, it can lead to bad breath, bleeding, receding gums, and even tooth loss. 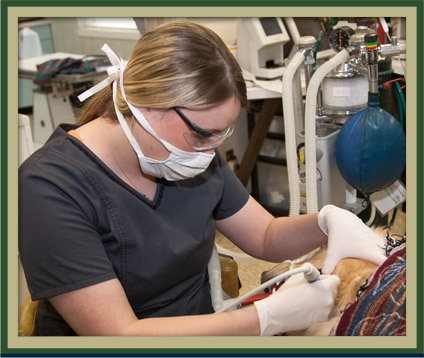 Our veterinarians and medical staff believe the centerpiece of good dental care is a complete oral exam followed by a thorough cleaning designed to remove plaque and slow its buildup. Should we find any issues, such as evidence of gum or tooth erosion, gingivitis, or excessive plaque buildup, we will discuss this with you and offer treatment options for your pet. We are experienced dental practitioners and can offer numerous dental procedures and oral surgeries. You can prevent serious dental problems by making sure your pet receives dental exams at the time of each vaccination, again at 6 months of age, and then annually. In between visits to Veterinary Medical Center, check your pet's teeth regularly for signs of problems. Brushing your pet's teeth is the single most important procedure you can do to maintain good oral health. If performed regularly, brushing dramatically decreases the incidence of gingivitis and can increase the interval between teeth cleaning appointments. If you are unsure of how to brush your pet's teeth, please ask a staff member at Veterinary Medical Center for instructions. Halitosis, or bad breath, is the most common sign of dental disease. Classic "doggy breath" is not necessarily normal. The major cause of halitosis is periodontal disease. This is an infection of the gums and potentially the other supporting structures of the teeth. Plaque builds up every day on the tooth surface, including at the gum line. Left in place, the plaque can mineralize, or harden, in less than two days, forming calculus or tartar. The continued build-up of tartar, both above and below the gum line, can eventually produce an environment for certain types of bacteria that may be more destructive to the periodontal tissues and also produce a more noticeable odor. If your pet is experiencing any of the above symptoms, please call Veterinary Medical Center today at (814) 623-1498 to set up an appointment, so your pet does not needlessly spend any more time suffering with oral discomfort.